The fascinating top order batsman of England, Ian Bell has ensured that his team will bounce back in the third and final Test against Pakistan in Dubai. Pakistan has scrambled the world ruling no.1, side in the opening two Tests by Surprise which was not expected by the visitors before the start of the tour. Their batsmen were unable to tackle the dangerous bowling attack of Pakistan and especially the spinners were unplayable. The first Test was played at Dubai International Cricket Stadium, which Pakistan won on the third day by ten wickets on January 19, 2012. 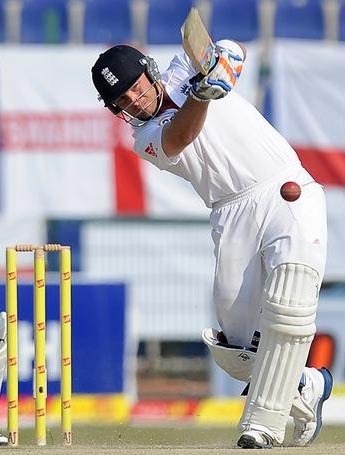 England was bowled out for 192 runs in their first innings and restricted to 160 in their second outing at the crease. Pakistan smashed 338 runs in their first innings and chased the target of 15 runs without any loss as the match was won by ten wickets. The off spinner Saeed Ajmal broke the back of their batting by grabbing seven wickets in the first Test, followed by three in the second. Leg spinner Abdur Rehman held four as Mohammad Hafeez claimed one wicket in the match. England folded the first innings of Pakistan for 257 runs in the second Test at Sheikh Zayed Stadium, Abu Dhabi. They thrashed 327 runs in their first innings and the hosts could manage 214 runs in their second innings. The visitors required 145 runs to win the match but they were sent back to the pavilion on mere 72 runs by the magical spinners of Pakistan led by Rehman who clinched six wickets. Pakistani spinners mesmerized the English batsmen and horrified them by securing 34 wickets in two Tests. Ian Ronald Bell has taken part in 71 Tests, smashed 5063 runs at an excellent average of 47.76, the best of 235 runs with 16 hundreds and 28 fifties. He is one of their top performers with the bat and has played many useful innings for the country. 29 -year-old Ian Bell thrashed unbeaten 103, 52, unbeaten 57 and 119 vs. Sri Lanka while continued blasting 45, 0, 31, 159, 34 and 235 against India in the home series conducted in the summer 2010. Pakistani spinners mesmerized the English batsmen and horrified them by securing 34 wickets in two Tests. Saeed Ajmal was declared ‘Player of the match’ in the first Test as he grasped 10 wickets in the first Test and held seven in the second. He completed his tally of 100 wickets in just 19 Tests while capturing the wicket of Matt Prior in the last innings of the second Test. Rehman was equally excellent by achieving four wickets in the first Test followed by eight in the second while holding the honours of ‘Player of the match’ as well. The third Test will be played at Dubai from February 3, 2012, England will do their best to win the last match while Pakistan will go for the clean sweep.